National Roofing Week 2017 | RJK Construction Co. | News and Events for RJK Construction Co.
RJK Construction is proud to join the National Roofing Contractors Association in recognizing National Roofing Week from June 4 through June 10, 2017. 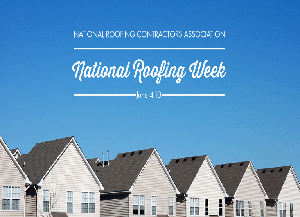 The NRCA organizes this Week to increase awareness about the significance of roofs to every home and business. You may not think about your roof every day, but we guarantee that the minute it fails you, you won't be able to stop thinking about it until the issue is resolved. At their very basic function, roofs provide shelter and protection for the outdoor elements. They protect our home interiors, our families, and our belongings. More so, a properly installed and insulated roof can contribute to energy cost savings. When you need a roofing repair or install, we hope you will contact a professional roofing contractor like RJK Construction.We operate with the highest degree of integrity and professionalism, allowing us to deliver the highest quality results.